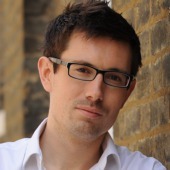 Mobile devices, Internet-based software and social media are transforming the workplace. Due to advances in connectivity, hardware and software, the enterprise as we know it is changing. With high-speed Internet connections (fixed and mobile), laptops, PDAs, tablets and Software-as-a-Service (SaaS), people can now work as effectively when they’re on the move as they can when sitting at their office desks. Whether in a satellite office, working from home or traveling to and from meetings, employees now have the ability to access whatever files and information they require on whichever device they are using. You only have to look at recent media stories for evidence that enterprise mobility is becoming an increasingly hot topic. A couple of recent examples are the launch of BlackBerry’s PlayBook, described as the “the world’s first professional tablet” by the company’s CEO, Mike Lazaridis, and the announcement of Salesforce.com‘s ( CRM – news – people ) Chatter Mobile for all major smartphone platforms. However, advances in technology are having a greater impact on the enterprise than just mobilizing the workforce. They have ensured that the enterprise is no longer a closed entity. As well as enabling employees to work outside of physical office walls, SaaS tools have made it possible for people to communicate effectively over firewalls and across the communication silos that have developed in traditional businesses. Boundaries have blurred and you now have a group of people working together, regardless of whether they’re in the same department, company or country. With SaaS coming of age and concerns around security and control being overcome, the social and enterprise worlds are colliding and social software is becoming more common in the workplace. Rather than having a fragmented flow of information due to red tape and inward-facing technology, business-grade Web 2.0 tools are enabling knowledge to flow more freely and efficiently. Information can be stored centrally and be accessible to anyone who needs it, rather than locked away on people’s laptops, buried in their inboxes or hidden in piles of paper on their desks. External experts and staff from other organizations can instantly access relevant project information rather than having to wait for files saved on in-house networks and shared drives to be e-mailed to them. There are no gatekeepers to required intelligence, and cross-department, cross-company and cross-territory collaboration becomes far simpler. As a result of this free-flow of information and ease of communication, the enterprise is becoming a more level playing field. The flat structure that is starting to replace the traditional business hierarchies can benefit everyone in the enterprise–from the management team to interns. With social technologies such as wiki-style whiteboards, instant messaging and discussion tools, user profiles and cloud-based file storage transforming the workplace, managers are no longer limited to using just the people within their team for a project. They have the ability to collaborate with people across all levels of the business and outside of the organization. There is a global, boundary-less pool of talent available and they can select the best people for the job based on their knowledge and expertise rather than their location or department. Managers have full visibility of who is contributing what to a project, what deadlines have been set (and missed) and what elements of the project require their approval. This level of transparency is also a benefit to the unsung heroes on the workforce. Rather than being overlooked because they don’t have the correct job title or because they’re new to the team, everyone has the opportunity to participate in a project and share their ideas. People that would never come into contact with the management team can communicate with them directly and become part of the decision-making process. An Indian businessman has built the world’s most expensive home – valued at $1 billion, with three helipads, its own air traffic control, a six-floor car park, a staff of 600, a four-storey hanging garden and a cinema. The 173-metre tall mansion is called Antilia, after a mythical island in the Atlantic Ocean, and has just been completed after seven years of construction. Owner Mukesh Ambani, his wife Nita and three children are set to move into the opulent 27-floor building after an housewarming party on October 28, which boosts a guest list of India’s elite that reportedly includes Prime Minister Manmohan Singh and star cricketer Sachin Tendulkar. The building soars high above Mumbai, giving its future residents a panoramic view of the country’s financial capital, including its slums, and the Arabian Sea. It was built to withstand military-grade explosions and an magnitude-8 earthquake, Indian media reported. “I have seen several houses, including that of Lakshmi Mittal (an Indian steel tycoon and also one of the world’s richest men),” a businessman, who was not named, told The Times of India. Mr Ambani, 53, is the world’s fourth richest man and has a personal wealth of about $27 billion, but is set to become the world’s richest in 2014, Forbes magazine estimated. He is the chairman of Reliance Industries, India’s largest private sector company, which has interests in oil, gas, textiles, retail and telecommunications. He also owns the Indian Premier League Twenty20 cricket team, the Mumbai Indians. While the home cost about $77 million to build, Mumbai’s growing property prices means Antilia is now estimated to be worth 15 times more – about $1 billion. An Indian design magazine editor, Shiny Varghese, said Antilia was “so obscenely lavish” that she doubted many other wealthy folk would splash out in such a manner. “But we are heading into the sort of culture where money is not a question when setting up a home,” Mr Varghese told The Guardian. Mr Ambani is believed to have previously avoided overt displays of his wealth, although Indian media reported his purchase of a $60 million Airbus corporate jet for his wife as a 44th birthday present in 2007. “Perhaps he has been stung by his portrayal in the media as an introvert,” Hamish McDonald, who has written a book about the family Mahabharata In Polyester, told the Guardian. Mr Ambani and his family are reportedly currently living in the more modest surrounds of a 14-storey apartment building. Antilia, dubbed the “mansion in the sky” by the Times, was built in consultation with US architecture firms Perkins and Will & Hirsch Bedner Associates. Its construction was reportedly influenced by Vaastu, an ancient Indian belief similarly to the Chinese’s Feng Shui. Each level is twice as high as a normal floor. No floors or rooms are the same, meaning the material used on one floor cannot be used in the construction of another level. The first six floors are taken up by a car park that can hold up to 168 cars. The next floor is the lobby, with nine lifts servicing the building. On the eight floor lies a 50-seat theatre. 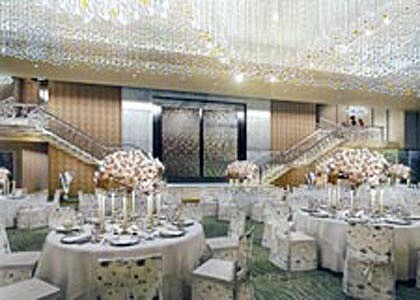 Another floor consists of a ballroom that has a ceiling mostly covered by crystal chandeliers. Other floors contain a health spa with a gym and dance studio, swimming pools, lounges, a vehicle maintenance area and, of course, guest rooms. The Ambani family will reside on the skyscraper’s top four floors, which takes up about 37,000 square metres. 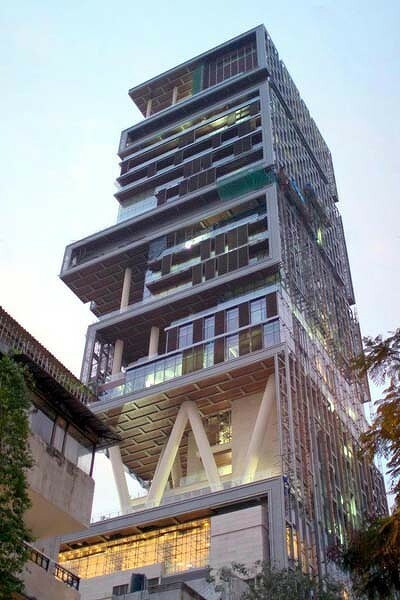 Mr Ambani’s home is the world’s most expensive, but he is not the only person to have built himself a luxurious abode. The Villa La Leopolda, on the French Riviera, was built in 1902 by King Leopold II of Belgium. It was last valued to be worth at least $US524 million and is reportedly owned by a Russian billionaire. Dracula’s Castle, in Romania, was built in the 14th century and is now a tourist museum. It is perched on top of a 61-metre rock, overlooks the village of Bran and has about 60 rooms. It is valued at about $US135 million. The Hearst mansion, also known as the Beverly House (not the Hearst Castle) in California, was valued at about $US165 million and has 29 bedrooms – but only three swimming pools. It is named after its former owner, newspaper baron William Randolph Hearst. It is now on the market for $US95 million after its current landlord filed for bankruptcy. The One Hyde Park penthouse, in London, has only six bedrooms but was sold for a cool £140 million ($226 million) in August. It has bulletproof windows, panic rooms and a numberplate-recognition security system for its car park. Its owners will be guarded by security guards who were trained by the SAS and served by staff from its neighbour, the Mandarin Oriental hotel. THE surging Australian dollar ranks as a far bigger influence on profitability than the threat of further interest rate rises, a survey of chief executives says, in a sign of the growing strain the currency is placing on many companies. The Australian Industry Group CEO survey, to be published today, underlines the challenges of the mining boom by nominating the high dollar as the top concern of business bosses – on a par with preparing for an economic upswing. The dollar – which has risen 10 per cent since early last month, eroding foreign earnings – was cited as the top influence on profits by 14 per cent of executives. Fewer than 5 per cent of the 378 chief executives nominated higher interest rates as a worry. Skills shortages, which are also expected to increase as the mining boom gathers momentum, were the top concern for 11 per cent of executives questioned for the report, which focused mainly on companies with turnover below $50 million. The growing signs of strain being caused by the dollar were confirmed by the NAB business confidence survey. NAB said overall confidence had slipped slightly last month but remained positive, suggesting the economy was on track to recover from weakness early in the quarter. However, the survey also highlighted the sharp difference between mining and other industries, with widespread weakness in wholesale, retail and manufacturing clashing with boom times for miners. ”Manufacturing has reported negative employment conditions for four months in a row, probably because its trade-exposed sectors have been pressured by slowing global growth and then by the appreciating Australian dollar,” the report said. Citing the growing pressure on exporters, the Ai Group chief executive, Heather Ridout, called for cuts in company tax and urged the government to encourage innovation and infrastructure development. ”By taking action in these areas, governments can lift the productivity of Australian businesses and assist in countering the structural pressures that many businesses are facing as a result of the mining boom,” she said. The top priority for governments for business, however, was keeping the economy out of recession, followed by reducing red tape. Although it highlighted the challenges of the mining boom, the Ai Group survey said most companies were banking on stronger profits in the year ahead. Three-quarters expected to hire more staff in the coming year; companies with turnover above $200 million were most likely to hire new workers.